Beyond Insights > News > Is Stock Market Trading for Everyone? Is stock market trading for you? 90% of people who traded in the stock market do not enjoy long term success. Do you have what it takes to be consistently profitable? 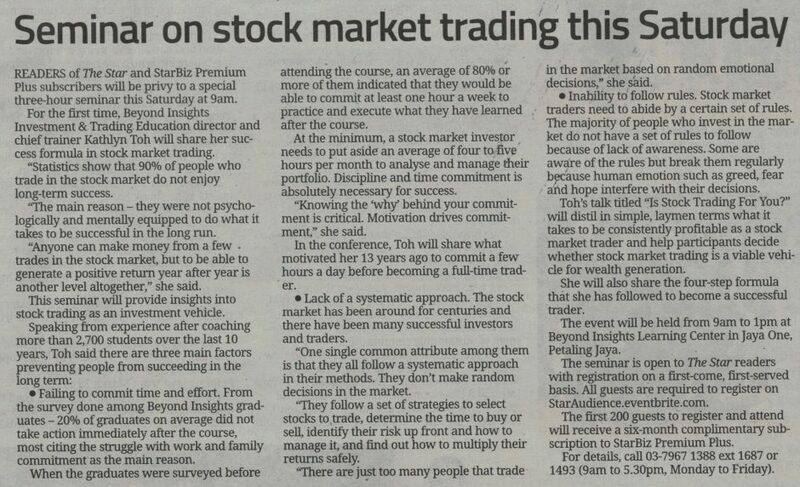 Petaling Jaya, Selangor, March 12, 2018– For the first time on coming Saturday 9am, 24th of March 2018, Kathlyn Toh, Director and Chief Trainer of Beyond Insights Investment & Trading Education will be sharing with StarBiz readers and subscribers her success formula in the stock market in a 3 hours seminar. This seminar will provide critical insights to those who are planning to take up stock trading as an investment vehicle, and those who have been doing it for a while without a satisfactory outcome. Failing to commit time and effort. From the survey done among Beyond Insights graduates –20% of graduates on average did not take action immediately after the course, most citing the struggle with work and family commitment as the main reason. When the graduates were surveyed before attending the course, an average 80% or more of them indicated they will be able to commit at least 1 hour a week to practice and execute what they have learned after the course. Yet, many will find it challenging in the end. At the minimum, a stock market investor needs to put in an average of 4 to 5 hours per month to analyze and manage their portfolio. It is not as “passive” as many would think and hence discipline and time commitment is absolutely necessary for success. “Knowing the WHY behind your commitment is critical. Motivation drives commitment.” In the conference, Kathlyn will be sharing about what motivated her 13 years ago to commit few hours a day as an engineer at that time to prepare herself in becoming a full time professional trader. Inability to follow “rules”. Road users need to abide by traffic rules. Likewise, stock market traders need to abide by a certain set of rules. Majority of people who invest in the market do not have a set of rules to follow due to lack of awareness. Some are aware of the rules but breaks them regularly because human emotion such as greed, fear and hope interfered with their decisions. Beyond Insights organizes an annual bootcamp for their graduates to instill the psychologically and mentally required for traders, because it is such an important aspect that stock traders need to master. Having the realization above clears the stumbling block that has tripped many in the stock market. Kathlyn’s talk, entitled “Is Stock Trading For You?”, will distill in simple, laymen terms what it takes to be consistently profitable as a stock market trader, and help participants decide whether stock market trading is a viable vehicle for wealth generation. She will also share the 4 step formula that she has followed to become a successful trader herself. The story of how her journey of transformation from a corporate employee to a full time trader will inspire you to take charge of your financial independence. This event will be held from 9am to 1pm at Beyond Insights Learning Center in Jaya One, Petaling Jaya. The seminar will be open to The Star readers with registration on a first-come, first-served basis. Attendees are required to register on http://StarAM.eventbrite.com. The first 200 attendees to register and attend will receive a 6-months complimentary subscription to StarBiz Premium. Beyond Insights Sdn. Bhd. was founded by Kathlyn Toh in 2008 on a mission to bring out the best in people and their financial future. To-date more than 2700 people from all walks of life have benefited from Beyond Insights’ education. The company provides a comprehensive set of curriculums in stock market investing and trading, covering topics from long term investing to short term and intraday trading, as well as leverage instruments such as Options and CFDs. Beyond Insights is the pioneer of Investing & Trading Psychology Boot-camps in Asia. The team currently comprise 21 coaches with actual market experience. They play a vital role in providing students with ample attention during classes as well as on-going support after graduation. Beyond Insights has won multiple awards over the years, including the Most Preferred Financial Educator in Invest Fair Malaysia 3 years in a row from 2014 to 2016. It was also awarded the Top Financial Training Company by Top10 Malaysia Magazine in 2013.